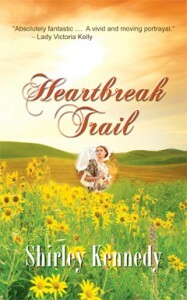 Heartbreak Trail (304 pp, $18.95, ISBN: 978-1-60381-831-5), by Shirley Kennedy, is a fascinating historical romance that unfolds on a wagon train plagued by misfortune. “A captivating story of perseverance and dedication …. This book is absolutely fantastic and worth the read …. I had no idea how much I would fall in love with it …. a vivid and moving portrayal ….” Read More …. Also available on Kindle and other ebook formats on Smashwords. 1850. Lucy, a pampered New Englander, is dragged by her husband and cold-hearted brother-in-law on a wagon train bound for California. The first casualty of the arduous trek is her husband. Lucy longs to return home, but that would mean abandoning her little stepson. How fortunate then that rugged Clint Palance, a former trapper and Indian scout, is watching over them both! As the journey progresses, Lucy faces deprivation, heartache, hardship, and more death. Then, with California just around the bend, Lucy must part from Clint. Will she find him again? Or must she return to a dull life in Boston, forsaking forever the beautiful West she has grown to love? Shirley Kennedy has published Regency romances for both Ballantine and Signet. Born and raised in Fresno, California, she has lived in Colorado, Texas, California, Bogota (Colombia) and Calgary (Alberta, Canada), where she earned a BS in Computer Sciences. Before returning to her first love, writing, she worked as a computer programmer/systems analyst for several years. Shirley currently resides in Las Vegas, Nevada where she belongs to The Romance Writers of America, Sisters in Crime, and Las Vegas Writers Group. Currently she’s working on another western historical novel. Check out her website: ShirleyKennedy.com. Heartbreak Trail is available in Kindle ($4.95) and print editions on Amazon.com, Amazon.co.uk, Amazon.de, and Amazon.fr. Bookstores and libraries can order by contacting info@Camelpress.com or through Ingram or Baker and Taylor. Other electronic versions can be purchased on Smashwords or at any of the major online ebook stores. At the guides’ wagon, she spied Clint sitting on the wagon seat, cleaning his rifle. Up to now, her concern over gossip would’ve prevented her from stopping to chat. Not today, though. She walked to his wagon, heart stirring at the sight of his lean, buckskin-clad form, so tough and sinewy, so very powerful. She felt a tug deep inside when she remembered how he’d scooped her up like a feather in his strong arms and saved her from the Indians. He joined her laughter. When it stopped, he regarded her a moment, then his breath caught and his arms went around her. Almost of their volition, her hands slid around to the back of his buckskin coat. He pulled her close. She pressed her fingers into the broad shoulders she’d admired from afar for so long. Their lips crushed together in a kiss so long overdue that she felt him tremble and knew she was trembling, too. She returned his kiss with reckless abandon, her mind spinning in several directions at once. How wonderful to be in his arms. How incredible. She could hardly believe her nightly impossible dream had finally come true. She had just drawn the rod out of the barrel when a painted, feathered savage, bare except for a breech cloth, leaped to the tongue of the wagon. For a horrified moment she stared at the fur, feathers, and beads dangling from the leather-wrapped tomahawk he brandished over his head. She swung her rifle around, jammed the rifle stock against her shoulder and aimed. Can I kill a man? The Indian raised his tomahawk, a savage, murderous gleam in his eyes. A hole appeared in the middle of the attacker’s forehead. His face grew slack. The tomahawk fell from his hand. He crumpled to the ground in front of her. She had killed a man, but no time to think about it. She must reload. Lucy tossed Chad her rifle. “You’ve got to reload!” She was reaching for the rifle Abner dropped when a horse carrying a Shoshone in feathers and full war paint sailed through the space between the wagons, causing a cloud of dust to rise when its hooves met the ground. For a few moments, the horse danced around, as if its rider were searching for a target. Chad was closest. Lucy’s heart nearly stopped when she saw the rider reach down and grab the boy by his long, blond hair. In his other hand he held a tomahawk raised high. The boy struggled, yelling at the top of his voice but couldn’t break away. “No, no!” Cordelia appeared from out of nowhere and hurled herself toward the Indian. “You let go of my son!” Wild-eyed, clawing and scratching, she grabbed the Indian’s bare leg and tried to pull him from his mount. The rider gave her a look of annoyance, as if she were a mere bug he needed to brush away. He drew back his leg, then struck her in the face with one swift, mighty kick. The blow sent her reeling. She fell to the ground and lay there, stunned. The Indian still held Chad’s hair firmly in his grasp. Helpless, Lucy watched as he raised his tomahawk higher. Oh, no, he’s going to scalp the boy! Suddenly a hole appeared in the Indian’s chest. An arc of blood spurted out. His eyes rolled upward as he let Chad go and fell from his horse, stone dead. Lucy took a swift look around. There stood Hannah, twenty feet away, lowering her rifle. “Got him!” She grabbed up another rifle and started shooting again.